And you can now own your own. 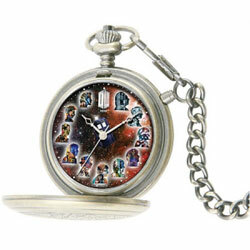 Forbidden Planet are offering the watch for £44.99 which is a little pricey but if you like to collect then its worth a look. A new Fob Watch is on the way to celebrate the anniversary. The perfect accessory for any true Whovian, this special edition of The Master's Fob Watch has an engraved design on the outer casing and a chain.